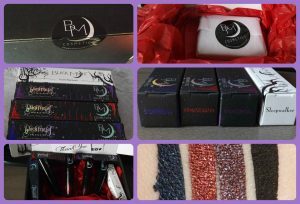 This is my first order from Black Moon Cosmetics and I’m very impressed. I’ve ordered them on the 3d of February 2017 and they arived on the 14th of February. I did not expect to recieve it so soon, so I’m really pleased with that. I’m the type of person who looks more at the product than the packaging, but the packaging is gorgeous. The colours I’ve ordered are Sorrow, Armageddon, Immortal and Sleepwalker. The swatches on my hand are not the best, but I’m not used to swatch make-up and the colours are better than the picture below. Sorrow, Armageddon and Immortal blackened metallics. Sleepwalker has to be my favourite black so far. Today I’m weraing Immortal, it’s been 8 hours since the first application and I haven’t had to touch it up (ate a pasta with pesto for dinner). They really dry down and do not feel dry at all. They feel really light on my lips, last a long time and I can already say that I’m going to wear these a lot. I can’t wait to get more liquid lipsticks from Black Moon Cosmetics. I haven’t bought any liquid lipsticks since I’ve purchased these four, so I can’t compare them to others. I’m still really happy that I’ve bought them, especially when I’m giving my baby boy a kiss on his forehead or cheeks. I’m clumsy and accidentally dropped Immortal, by now it has dried up. I want to replace it with a new one, because out of all my purple lipsticks, it’s one of my favourite shades. I wear sleepwalker the most out of all my lipsticks.